You’ve poured blood, sweat, and probably some tears into building your business with a website, Facebook page, a Twitter feed-but no one is clicking/liking/following. Why does it seem so easy for competitors-maybe even with an inferior product-to generate traffic, likes, and credibility online while you are struggling? Two words: Content Strategy. Without a coherent content strategy for your business, all of your hard work can be like that tree falling in the forest: no one will hear it and it definitely won’t make a sound. Content Strategy is just as important to the owner of a small manufacturing business as it is to the second-career consultant. It matters whether you are B2B or B2C. 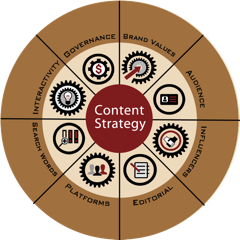 Content Strategy is the linchpin of your success in the current business climate. Content Strategy is the strategic plan and implementation roadmap for how your business will generate trust, credibility, and engage your customers in your brand experience through the provision of timely, valuable content that addresses their needs and delivers benefits. The extreme example of a business who has taken Content Strategy and it’s close cousin, Content Marketing to heart is Red Bull: no longer merely an energy drink manufacturer, Red Bull has become a brand that delivers an action adventure experience to its customers through their media production channels on Youtube, their publications, and their website. Of course not every small business can be a Red Bull: but it is no longer enough to run your business and expect growth in the traditional way. Engagement driven by content is the new normal for companies big and small. Content Strategy is made up of eight areas of focus that can be imagined as 8 “slices” of the Content Strategy pie. Each slice has some overlap with the others so it’s important to approach your content strategy holistically; it’s difficult to do one really well without doing them all. A great Content Strategy goes through each of these areas: your Brand Values, Audience to determine your exact target demographic, Influencers in your field, Editorial planning and guidelines, Social and technological platforms, Search Engine Optimisation and marketing, Interactivity with your customer in the form of user generated content or reviews, or the provision of tools and dashboards, and most important: Governance. It is a deep and broad digital business planning process that ensures that all of your business communications are designed for maximum growth. What has emerged in the last 3-5 years has been a complete upheaval in the world of media, business, and especially in advertising. Consumers today have infinite choice in their media consumption from a virtual firehose of information on the Internet. Media companies, Marketing agencies, and Businesses are all competing for your customer’s attention on the same vast playing field. And, you’re competing for your customer’s attention with your competitors and even with your customer’s family and friends with their opinions and perceptions, and the media they create. The Internet is a double edged sword for business. On the one hand, it enables businesses to advertise and reach so many more people, almost for free. Did you know that for about a dollar a day, you can reach 4000 people each daily on Facebook? And these people will be exactly in your target demographic (if you’ve done the work to determine it!) . This is not only a fraction of the cost of television advertising; it is far more likely to lead to actual conversions. So this is the good news, and some form of paid advertising on Facebook or using Google adwords will usually be part of your Content Strategy. The bad news is that advertising is not enough to get your brand and your business out there. In the race to gain your consumer’s trust and attention, the only way to stay in the race is to produce valuable content. Content Strategy is a non negotiable, and what that means is that businesses, big or small, need to create valuable, findable content as part of their plans to generate leads and build their customer base. It’s very easy to say that businesses need to become content producers, but it’s never easy for a small business owner to imagine how you will find the time, the skills and the staff to create content on top of everything else you have to do to sustain and grow your business. That’s where the Governance piece of the Content Strategy pie comes in: in the next post in this series, we’ll walk through what a content strategy Governance model looks like, and how a business of any size can make Content Strategy work to sustain and grow their customer base. For more resources and information on Content Strategy and to download a detailed description of what content strategy entails, go to analyticalengine.ca/resources or download a Content Strategy Infographic at http://bit.ly/1qY9tYp.